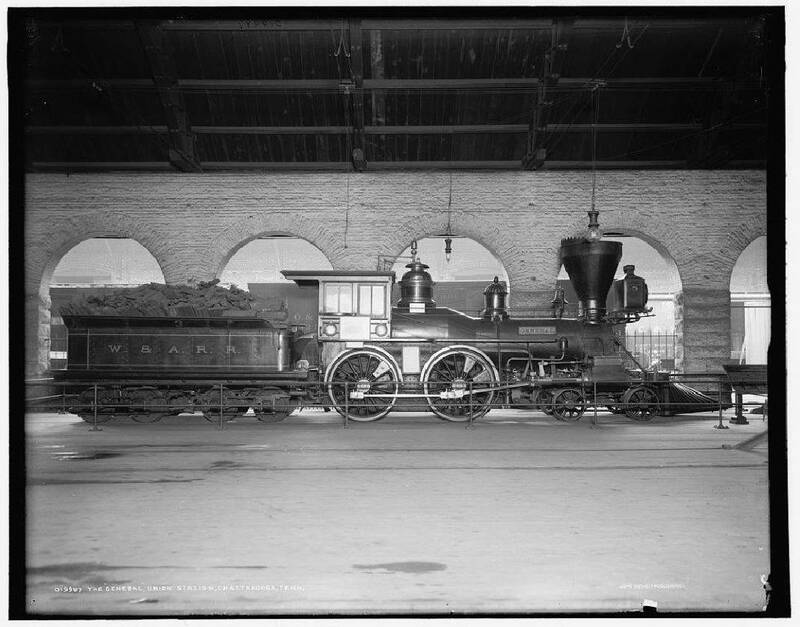 The General on display at Union Station in Chattanooga in 1907. One of the most famous incidents of the Civil War in our area was the Great Locomotive Chase — an episode in April 1862 in which Union raiders hijacked a train pulled by a steam locomotive, the "General," with the intention of destroying bridges, track and telegraph wire between Chattanooga and Marietta, Ga.
A determined pursuit by Confederates frustrated the plan, and the General was abandoned by its captors just north of Ringgold. Eight of the raiders were executed by Confederate authorities and the first Medals of Honor were awarded as a result of the raid. Years later, another battle was fought over the General, by men no less determined. The weapons were writs, motions and briefs and men styled as "raiders" were once more defeated. The General survived the Civil War and eventually was returned to the Western and Atlantic Railroad, itself a property of the State of Georgia. The railroad and its rolling stock was leased, eventually to the Nashville, Chattanooga & St. Louis Railway. An employee of that company found the engine, which was "condemned, value $1,500" on a siding in Vinings, Ga. It was rehabilitated for display and first appeared at a veterans reunion in Chattanooga in 1892. The General remained on display in the old Union Station until 1961 except for brief intervals. A plaque at the station recounted the story of the engine. Several pamphlets and advertisements noted that Chattanooga was the permanent home of the General. For example, the General was temporarily taken to Chicago by the Nashville, Chattanooga & St. Louis Railway, where it was put on display at the Chicago World's Fair of 1933. It was stated "the permanent resting place of this famed relic of the Civil War is in the Union Station at Chattanooga, where it stands as a memorial to American valor and has been seen by travelers passing through Chattanooga over the Nashville, Chattanooga & St. Louis Railway." For its part, the city of Chattanooga placed an image of the engine on its city seal and promoted it as a tourist attraction. As noted by the late U.S. District Judge Frank Wilson, "upon two previous occasions, once in 1939 and again in 1959, efforts were made by the State of Georgia to recover the General, the attempts were met by spirited opposition on the part of the City of Chattanooga and its citizens. Upon each of these occasions many statements were made by public and private individuals in opposition to the move." In 1961, however, the Louisville and Nashville Railroad (the successor to the Nashville, Chattanooga & St. Louis) removed the engine from Chattanooga. The story was that the engine was to be rehabilitated and displayed across the country for the Civil War Centennial. But in 1967, the railroad announced that the General "would be delivered to the State of Georgia for permanent placement and display at Kennesaw, Ga., the place of its capture by Andrews' Raiders in 1862. Delivery of the engine to Kennesaw was to be made before Sept. 14, 1967, for ceremonies scheduled on that date." To get to Kennesaw, the engine had to go through Chattanooga. The city filed a lawsuit and served an attachment on the railroad at 1:30 a.m. on Sept. 12, 1967. Mayor Ralph Kelley, Police Commissioner "Bookie" Turner, Chancery Court Officer Joe Hogue and others met the train and stopped it by parking a police car across the tracks, thereby becoming known as "Kelley's Raiders." The ultimate legal issue was whether the railroad's years of publicizing Chattanooga as the General's permanent home created a charitable trust in favor of the city and its citizens, requiring the railroad to keep the famed engine in town. The case ended up in federal court, and in a ruling issued in 1969, Judge Wilson determined that the engine was the property of the State of Georgia, which could do what it wanted with the General. Futile efforts were made to reverse the judge's ruling, which failed in the United States Court of Appeals, with a further appeal being denied by the United States Supreme Court. Eventually, it was moved to Kennesaw, where it remains today. Sam D. Elliott is a local attorney with Gearhiser, Peters, Elliott and Cannon, a member and past chairman of the Tennessee Historical Commission and author or editor of several books and essays on the Civil War, including a forthcoming biography of Gen. John C. Brown. Visit Chattahistoricalassoc.org for more information.